Over the past couple of years, claims involving spiritual abuse such as secret marriages, sexual abuse, bullying, and financial fraud have come to surface in the Muslim community. Community members have attempted to address these claims in varying ways from ‘outing’ alleged perpetrators to lawsuits to communal redress. One method of communal redress some members and leaders have taken are what appear to be arbitration or mediation. Unfortunately, the execution of these attempts at redress, though well-intentioned – and sometimes ill-intentioned—have been disasters. Even worse, some of these disasters have been viewed by the community as successes due to them not knowing how these situations were actually handled behind the scenes. I like to call these instances ’faux-arbitration‘ because those heading it only appear to be addressing the victims’ claims but the methods employed are for show only, as described in “Who Will Mind the Minders.” Here, I will explain the proper way of handling internal redress of claims involving spiritual abuse by explaining Alternative Dispute Resolution (ADR), abuse of ADR by our community leaders, and rules and principles communities should follow going forward. There are two main ways disputes can be handled within the legal system: 1) litigation (aka lawsuits) or be Alternative Dispute Resolution (ADR). In the context of a lawsuit, there are two ways a case can be filed: 1) as a civil claim or 2) as a criminal case. Whether a case is criminal or civil, they essentially start with a ‘complaint’ which is the legal document that is submitted to a court and lays out all the legal claims and requested remedies. It is also important to understand that in the criminal context, the ’client‘ is the State and not the victim. In other words, the State is concerned with its own interest and not the victims in pursuing a criminal case. Another key distinction between civil and criminal cases is the evidentiary standard. Civil cases have a standard of ’preponderance of the evidence‘ which means that the evidence presented must demonstrate the plaintiff’s claim is ’more likely than not‘ to be true. This is in contrast to criminal claims which have a ’beyond a reasonable doubt’ standard, which means that the prosecutor must demonstrate there is no reasonable doubt as to the defendant’s guilt. In sum, it is much more difficult to criminally convict a defendant in a criminal case versus proving the equivalent claim in a civil case. Depending on the claims, a claim can be filed as both civil and criminal claims as separate actions. Lastly, a practical difference between civil and criminal cases is attorneys’ fees. Because criminal cases are prosecuted by the state, a victim does not need to hire an attorney to have his or claims prosecuted. However, because that victim is not the client, the remedy often does not center around the victim. Rather, the focus is punishing the perpetrator. If a victim wants his or her remedies, an attorney would have to be hired to file a civil claim and this can be cost-prohibitive for most people. The other option is self-regulation by the community through Alternative Dispute Resolution (ADR). The two types of ADR’s are mediation and arbitration. ADR, regardless of the type, entail the parties having their dispute resolved by an impartial third person or panel. The difference between mediation and arbitration is the goal of the process. The terms of the ADR are through contract and depending on what the parties agree to; the ADR can be binding or non-binding. In mediation, the goal is for the parties to reach a compromise. Mediation is typically used in marital and business disputes. This is in contrast to arbitration, where the parties essentially put on their ’cases’ in a less formal setting than a trial before a panel of arbitrators and the arbitrators come to finding a proposed remedy, which the parties may be required to accept, depending on the agreed upon terms of the arbitration. Given the nature of abuse claims, mediation is not a useful option as the two parties are not in a dispute in which a compromise can be reached. In other words, this is not a custody battle nor a dispute over business assets. Rather, because there is a claim against one party by another, a factual inquiry needs to be undertaken and this could be accomplished through arbitration. However, it is notable that though the process is much more expedited and less expensive, the discovery process is also less formal and witnesses cannot be compelled by the parties to appear for an arbitration. Rather, it is the arbitrator(s) who compel parties to appear to produce evidence. Because the discovery scope of arbitration tends to be much more limited due to the parties having less power to seek information from third parties, arbitration may not be the best option. A key difference between ADR and litigation is that litigation can be legally imposed on a party whereas ADR cannot typically be imposed. In other words, absent a contract, a party is not required to submit to an ADR (but can voluntarily do so). With that said, the ADR contract can require that all parties submit to the arbitrator’s findings if both parties agree to do so beforehand. However, once a lawsuit is filed and a party is served, he or she must submit to the lawsuit. A shaykh purportedly sought to address a victim’s complaint against another shaykh for fraudulent inducement of marriage (i.e., lying to the sister in order for her to agree to the marriage). In this real-life example, the mediating “shaykh” told the victim he would push for remedies for her situation but turned around and told the abusing shaykh’s Muslim employer that no abuse took place and this was a “private matter” between spouses. In reality, this mediating shaykh was seeking to only silence the victim through appeasement by presenting remedies that could and would not ultimately be enforced. The problem here is that the mediating shaykh was not truly interested in addressing the sister’s claims and was playing both sides by engaging in manipulation and delay tactics in order to ultimately avoid accountability. The mediating shaykh was able to accomplish this double-play through lack of transparency. 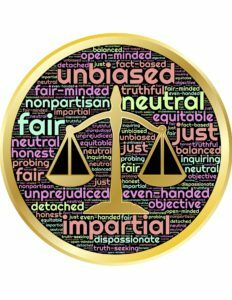 Another real-life example is an arbitrator who sought to ’arbitrate‘ his own personal conflicts in the same proceeding as the spiritual abuse complaint. This arbitrator had a financial conflict with an accused imam and the arbitrator’s choice in exposing the accused imam publicly was more of an act of revenge against the accused given that the victims’ grievances were never actually addressed and the arbitrator was aware of the accused’s imam’s tactics long before the complaints, yet only stopped endorsing the accused imam after their financial conflict arose. The above examples ultimately did not help the victims and even caused more distress, not only for the victims, but the community at large. On their face, those who lead arbitrations appeared to have engaged in some sort of ADR but if you scratch the surface, their processes were riddled with conflicts of interest, or lack of transparency, and no defining of terms whatsoever. This ultimately creates more harm than good as abuse of ADR is further perpetuation of spiritual abuse while convincing victims they are being made whole. As stated above, ADR is typically based in a contract. The parties, specifically the accuser and the accused, will agree to the terms of the arbitration (or mediation where it may be appropriate). Terms included will be scope of the claims, scope of discovery, paying for expenses related to the arbitration, whether the arbitration will be binding or non-binding, and who should serve as the arbitrators and whether the arbitrators should have specific expertise (e.g., an accountant in a claim involving stolen money). I recommend that the role of the arbitrators be to gather evidence, hear testimony from both parties and their witnesses, decide the specific issues based on the accuser’s claim, and provide a written analysis of the bases of their findings. This should be done with the assistance of an attorney or someone with a legal background equipped with these skills. Although arbitrations are not always this detailed and intense, given the community’s interest at large and the dire need for good precedence on handling these situations, I highly recommend this level of thoroughness. This does not suggest each arbitration be publicized, but just that a record be available and not subject to legal confidentiality. Another important aspect is transparency. The ADR process should be clearly laid out as well as the specific issues being addressed, and which and how the facts are applied to the conclusion that the arbitrators ultimately reach. For example, when claiming that an abuser perpetrated ’spiritual abuse,’ the specific offenses need to be mentioned at the outset and the findings should clearly detail which facts speak for or against this claim. It is not enough to simply list terms and claims without clearly listing the elements for each claim. Additionally, the arbitrators should list all the evidence and testimony that was taken into consideration. Further, while settlements arising out of disputes are often subject to confidentiality clauses, given that our community at large has an interest regarding claims involving spiritual abuse, I generally recommend against subjecting such arbitrations to confidentiality. Lastly, it is important to decide who should serve as the arbitrator or arbitrating panel. Under no circumstance should a member of the institution serve as the arbitrator as this would be a conflict of interest between the institution’s interests and the victim’s interests. Further, anyone with a personal conflict or interest with any of the parties should also not serve as an arbitrator. Arbitration done correctly is a powerful tool for addressing cases of spiritual abuse. Creating a system for arbitration is a powerful tool that allows victims to petition, or pressure at a social level, and compel Islamic institutions to investigate harms which require alleged abusers to submit to the process and remedies. Though arbitration is limiting, it may be a good alternative to a cost-prohibitive and lengthy process of litigation. Lastly, in addition to involving those with Islamic training and who understand spiritual abuse, a local attorney should be consulted because arbitration clauses can be complicated proper wording is key to enforcement. The method of addressing claims of spiritual abuse should be handled on a case-by-case basis. In some instances, going straight to the community may be warranted. In other cases, arbitration or mediation is the best method. Arbitration is a service that In Shaykh’s Clothing offers. We have a team of scholars, lawyers, and subject-matter experts who can use their expertise to properly evaluate evidence presented before them in order to make sound and informed findings. Further, when ADR is necessary, we know which third-party expertise are necessary for a mediation or arbitration panel. We are happy to walk the victims and parties involved through our method, including coming to an agreement on which people to involve, as needed in order to make the victims whole while protecting our community from further abuse.